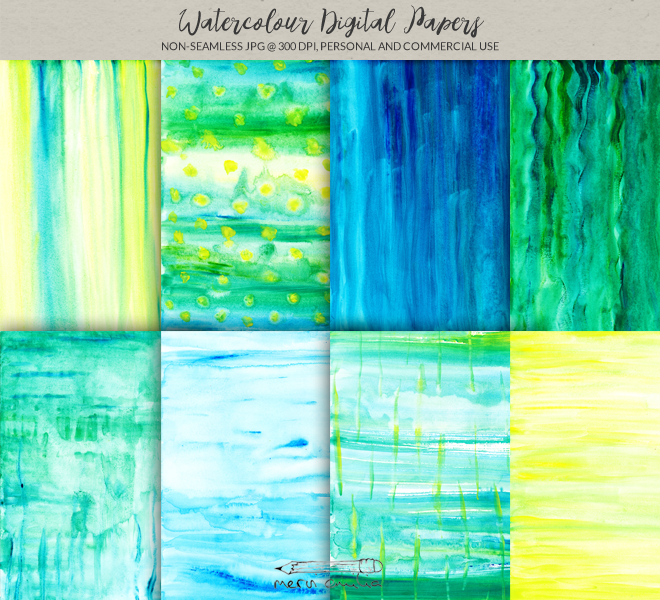 Green, yellow and blue watercolour digital paper pack for personal and commercial use. Can be printed* or used for digital works, such as web design, backgrounds and more. The digital papers/patterns you have purchased are for both personal and commercial use. The digital papers/patterns can be used as part of web images and graphics or as website backgrounds. You may use the digital papers/patterns within your own design, painting etc. You may distribute (including commercially) the design, painting etc. which you have created with using the digital papers/patterns. You may NOT reproduce, redistribute, give away or sell the digital papers/patterns or modified versions of the digital papers/patterns or parts of them in any form or way, including as brushes, clip art or digital papers/patterns. *) The colours may change when printed. Screen and print colours may differ. It has also to do with the printer and it's calibration.